ORIGINAL MICHILIMACKINAC BANDS » Global Warming – Fact or Fiction? The science is settled, the debate is over! So say some prominent politicians, government bureaucrats, and a handful of so-called scientists who push the notion of a global climate that is warming rapidly and uncontrollably with time. The problem of a warming earth’s atmosphere seemingly was raised first in the early 20th century; it achieved worldwide prominence in the second half of the century around the time that the then compelling global cooling scare that lasted for about 25 years mid-century was losing steam. The Warmists, those who dogmatically embrace the philosophy, have attributed the anomalous heating to increases in concentrations of greenhouse gases that tend selectively to trap heat within the atmosphere. The gases included are water vapor, carbon dioxide, methane, nitrous oxide, and ozone. Of particular interest and concern to the Warmists is carbon dioxide (CO2) that is produced, in part, by man’s burning of fossil fuels, namely oil, natural gas, coal, and wood. The implication, actually the assertion, by the Warmists is that man bears primary responsibility for the apparent temperature increase because of his profligate use of those fossil fuels. Moreover the Warmists direct much of their ire toward the United States because of its rapid rise to prominence in the industrial world during the 20th century, a rise resulting in part from its ready accessibility to those relatively inexpensive fuels. It is fact that a small increase of global temperatures during the last quarter of the 20th century is correlated with a contemporaneous increase in the concentration of atmospheric CO2. It is notable, however, that from 1950 to about 1975, temperature was more or less constant while CO2 concentration increased, i.e. the two are not correlated. It is significant that the latter half of the century, the period following the end of World War II, encompasses a span of time during which world-wide industry expanded at unprecedented rates and fossil fuel exploitation was intense. Yet a correlation of atmospheric temperature with CO2 is apparent only during a part of that period. It is perhaps more significant that the Warmists draw from any CO2/temperature correlation a cause-effect relationship, that is increasing temperature results solely from an increasing concentration of CO2. But any credible scientist knows that while there certainly is a probability that such a relationship may exist, the level of probability that can be deduced from the existing data definitely is far from perfect, i.e. the data do not establish the relationship unequivocally. In other words, while there may indeed be a direct cause-effect relationship between CO2concentration and atmospheric temperatures, the existing data do not permit an estimate of the strength of the relationship. To do that would require an understanding, in quantitative terms, of the effects of the other greenhouse gases on atmospheric temperatures. And that has not been done yet with any rigor. If, as the Warmists claim, man is solely responsible for the global heat rise, that responsibility should be manifested in the CO2/temperature data. 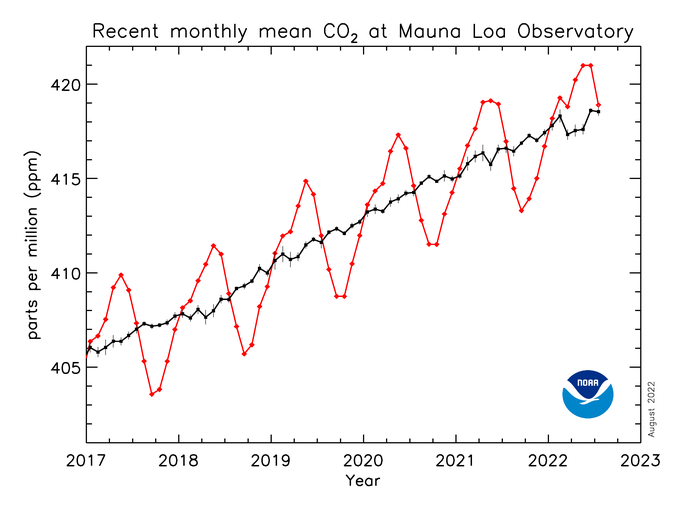 Moreover, if the effect – temperature increase – was the unequivocal result of the singular cause – increased concentration of CO2 - then the atmospheric temperature curve should continuously track the CO2 curve which shows a non-linear but continuous increase with time for the past 100 years or so. But it doesn’t as the temperature curve for the 3rd quarter of the 20th century shows! Moreover, for the last decade and one-half the global atmospheric temperature has leveled off – it has shown no perceptible increase during that time period even while the concentration of CO2 has continued to rise at a more or less steady rate. In other words the temperature of the earth’s atmosphere for the past 15 years or so has not increased; there has been no global warming during that time period of a decade and a half. How then can the Warmists trumpet global warming when there has been none? More importantly, how can they blame man for a problem that data show does not exist? Obviously they can do neither logically. But logic seems not to deter the Warmists from their goal of replacing fossil fuels with alternative energy sources, wind and solar primarily, so in furtherance of their goal while attempting to maintain a semblance of credibility they chose merely to redefine the problem. And so global warming morphed to the more benign and less frightening sobriquet of climate change, a well-defined and highly complex scientific subject that incorporates, among other natural processes, atmospheric temperature changes, both warming and cooling. The change from a narrowly focused idea – global warming – to one with a broader scientific foundation – climate change – presumably was designed, at least in part, to reconcile inconsistencies in certain Warmist’s arguments, two of which are especially relevant. First is the failure of atmospheric temperatures to correlate with CO2 increases during the first 15 years of the 21st century. And secondly are questions that have been raised by skeptical scientists concerning the ability of existing large-scale climate models to accurately predict future climates 20-100 years into the future? A particularly vexing problem noted by some in the modeling community is the difficulty of accurately incorporating the effects of water vapor into the models. The modeling problem is important because the coming climate catastrophe predicted by the Warmists is based, in large part, on the use of mathematical models to predict future temperatures long-term. The change may also have been an attempt to reduce some of the ridicule that was occasioned by episodes of unusually cold weather in various locations on the planet (In North America, the winters of 2013-14 and 2014-15 are notable examples). But as all serious scientists know, the climate is inherently variable and has responded to natural forces on time scales ranging from a few hundreds of years to several millions of years. An example of the former is the little ice age that occurred between the 16th and 19th centuries while the classic example of the latter is the great Pleistocene Ice Age, during which the northern portion of North America was covered with a sheet of ice 2-3 km thick. The latest stage of the Pleistocene only ended about 12,000 years before the present (BP). A climate change event of intermediate duration is represented by the Altithermal period that occurred some 8,000 to 5,000 BP; it was characterized by temperatures higher than they were before the onset of the Altithermal and higher than they are today. In other words the Altithermal was a period of extreme global warming. And none of those earlier changes were associated directly with the activities of mankind rather they were events forced by natural factors that because of their complexities may or may not be well understood, i.e. the science is not settled. But since the Warmists are predisposed to blame any changes of climate on the activities of man and the use of the term climate change implies a natural cause, another name change was needed. So to minimize the undesirable effects of nature and maximize the deleterious effects of man, climate change had to morph, and it did. The new term was Global Climate Disruption (GCD). A major precept of GCD is that the greenhouse gas emitting activities of humans is causing increasing occurrences of more extreme climate events, hurricanes and tornados in particular, and more natural disasters, floods, droughts, wildfires, etc. No less than the President of the United States has made that assertion frequently and publicly. Notwithstanding the President’s proclamation, there is no evidence to indicate the assertion is valid. In a recent article in the Washington Post, the noted author and columnist Dr. Charles Krauthammer cited government reports that show a decline in extreme climatic activity in North America during the past three decades. Specifically, records for the year 2013 show the occurrence of the fewest number of Atlantic hurricanes in the past 31 years. In 2014, the number of Atlantic hurricanes declined even further. Additionally, extreme tornadic activity has shown a 30 percent decrease in the U.S. in the past 30 years. The present drought in California has been attributed to climate warming however the mathematical models that purport to predict future atmospheric warming and concomitant climate catastrophe imply the opposite would happen, that is precipitation during the winter rainy season should increase and not decrease. That result contradicts the reality of the present drought there. Additionally there are many climate experts who generally discount atmospheric warming as the cause of the California drought. And the wildfire problem seems to be more related to land use patterns, most notably the incursion of humans into formerly unpopulated wilderness, and wildland management practices of state and federal governments than to any changes in the climate. So, the Warmists arguments that man’s activities are disrupting the climate in a negative sense, i.e. there are more hurricanes and tornados then there were in past years, are refuted by the records and observations of climate experts. The available evidence and sound scientific reasoning also fails to establish a clear cause-effect relationship between man’s activities and climate disruptions as the Warmists assert. From global warming through climate change to global climate disruption, the constant that provides a connecting thread to the Warmist’s philosophy is that any time or space scale climate perturbations are the responsibility of man, specifically his exploitation of fossil fuels. The many other natural factors that could contribute to the perceived anomaly are never considered even though the term climate change implies the existence and perhaps even the dominance of such factors. For example, the failure of atmospheric temperature to rise despite a continuing increase of CO2 during the young 21st century suggests that other internal factors, biological and physical, as well as other greenhouse gases can also influence global temperature and indeed may be the primary drivers of any perceived temperature changes. In addition, an external factor that comes immediately to mind is solar activity and the many obvious ways that the Sun’s cyclicity and variability affects the Earth’s atmosphere. Unfortunately additional factors have not yet been addressed in any meaningful way by the Warmists – and probably never will be as to do so would be an implicit rejection of the notion of a settled science. The failure of the Warmists to establish a quantifiable and irrefutable cause/effect relationship between CO2concentration and global temperature increases plus the leveling off of the temperature curve during the past fifteen or so years are indications that man’s effects on warming of the planet is far from unequivocal and the science that controls the perceived problem is far from settled – no matter what the Warmists claim. An important element of Warmist’s strategy is convincing the general, non-science trained, public of a coming climate catastrophe that would disrupt their lives in many undesirable ways, e.g. drought, famine, debilitating illness, and physical dislocation will become common features of everyday life. One prominent former politician, a Nobel Peace Prize winner, and a recipient of potentially large profits from the incipient market for trading carbon offsets or credits, has even called global warming the ultimate weapon of mass destruction. Apparently he equates the problem with nuclear destruction. Because of its reputed seriousness the Warmists claim the problem must be countered by all means at our disposal. And it must be done – now –even if that means putting perhaps the greatest economy in the world at serious risk – maybe even in jeopardy of failure while totally ignoring the massive contributions of greenhouse gases by the country of China. Describing global warming as a weapon of mass destruction surely is designed to strike fear into the hearts of concerned citizens everywhere and to coax their acquiescence to the Warmists schemes for mitigating the perceived problem, one of which will involve the spending of large sums of tax money to finance and to subsidize high-risk ventures. One of the most important of those schemes is the promotion of alternative energy sources. A most conspicuous manifestation of that particular effort is the appearance of large farms of electricity-generating wind turbines and expansive arrays of solar electric generating systems, both photovoltaic and thermal types that stretch across the United States from the Atlantic Ocean in the east to the shores of the Pacific Ocean in the west. Now the desirability of developing sources of energy that are non-polluting alternatives to conventional fossil-fueled electricity generators is without question. No reasonable individual could argue against or question the value of a cleaner atmosphere on personal well-being. However, readily available evidence indicates that the cost of energy produced by wind or solar far exceeds that produced by fossil fueled plants sometimes by a factor of 2. The elevated costs of the alternative sources, due in part to significantly reduced efficiencies, are borne by the energy consuming public who must sacrifice a portion of their discretionary funds for necessities of life. Regarding energy production, power from the wind is limited by strength and variability of prevailing winds. It has been estimated that wind systems are functional, that is generating electricity, not more than 30 percent of the time. Solar systems are functional only during cloudless daylight hours and that may vary from 0 to 8 hours per day during the northern hemisphere winter. A back-up conventional generation system is required for those times when the established wind and solar systems are non-functional thus sources of alternative energy do not totally solve the problem of greenhouse gases. In the absence of a global warming imperative to significantly reduce greenhouse gases, the cost-effectiveness of wind and solar energy alternatives appears to be rather low and would not justify the economic disruption that would be forced by large scale conversion to fossil-fuel alternatives in the near term. An immediate adverse impact of the conversion strategy can be seen in the retrenchment of the US coal mining industry and the loss of jobs in that important sector of the economy. Given the unfavorable economics, a slower more measured approach to the development of alternative energy sources would seem more logical than the one that is now being vigorously advocated and pursued by the US government. And it might better be driven more effectively and efficiently by the private sector. In many innovative but untested commercial endeavors there often are unintended consequences and they are numerous with the wind turbine and solar systems industries. Wind turbines and thermal solar systems are notorious for their harmful effects on birds. Birds in flight have no mechanism to sense rotating turbine vanes and certainly have no defense against them. Eagles and bats seem especially susceptible to the dangers of whirling turbines and some believe they may be on the road to extinction In addition, wind turbines have been objected to by many who reside in their vicinity because of noise created by the rotating blades and the negative aesthetic and value effects that they may have on residential neighborhoods. The Ivanpah thermal solar facility occupies an area of more than 5 square miles (4,000 acres) in the desert of southern California . It is comprised of 3 tall towers with a steam boiler mounted atop each one. The towers are surrounded by more than 300,000 mirrors that focus sunlight on the boilers to generate heat that in turn produces steam; the steam from each boiler drives a generator. Initial plant construction necessitated the relocation of populations of the endangered desert tortoise. After start-up, intense temperature and energy fields created by the mirrors, has tended to disorient and sometimes incinerate birds that fly within or even in proximity to those fields. The bird mortality rate at Ivanpah is reported to be high and has provoked much local concern. In addition to its troubling ecological impacts, energy generation at Ivanpah during its first year of operation has fallen well below initial projections Because of the numerous problems encountered at Ivanpah, the future of solar thermal energy production appears to be bleak. So, is the science settled? – is the debate over? Is the Warmist’s “sky is falling” climate catastrophe prophecy valid? The evidence presented herein seems to say no to all of those questions, and thus to the need for an economy-destroying plan to transform the energy industry of the United States overnight. That conclusion is supported by the following passage from the Global Warming Petition Project which has been signed by more than 30,000 scientists, approximately 30 percent of whom have Ph.Ds. To add emphasis to the assertion of those 30,000 scientists, the aforementioned Dr. Krauthammer stated in his Washington Post article, “I believe that those scientists who pretend to know exactly what this (accumulation of CO2 in the atmosphere) will cause in 20, 30 or 50 years are white-coated propagandists.” Significantly the general population, even those who do not understand the details of climate science and who once were closely attuned to the Warmist’s propaganda, are beginning to see the need for logical thought in this important matter. Skeptics applaud that attitude and welcome them to the debate. Charles E. Adams, Jr., Ph.D.